The Hundred Rolls of Shropshire for the year 1180 in the reign of King Henry 11 (1154 - 1189) record the village of Schelfe in Shropshire. In 1249, Eyton's "Antiquities of Shropshire" give the spelling as "Schylve", and this village is believed to be the origination for the later surname of Shelvey or Shilvey. The development is from the Olde English pre 6th Century "scylf", meaning a hillside or "shelf", and apparently the village is on the top of a hill. In fact, "scylf", plus a suffix such as "tun" (now ton), or "field" or "hanger", are quite regular place recordings in England. 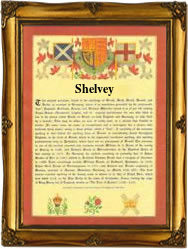 The name spelling forms would seem to be Shelvy or Shelvey, although neither form is to be found in Shropshire itself. This suggests that at some time the village was "cleared", either through Plague, Civil War, or agricultural clearance on the Enclosure Acts of the 16th to 18th Centuries. When this occurred the inhabitants would have been scattered in all directions, taking the name of their former village as their own identification. In most cases the healthy inhabitants would have headed for London, the others however would have tried for more local accommodation. Examples of recordings include: Elizabeth Shelvey, who married Edmund Terry at St. Leonard's, Shoreditch, London, on February 19th 1776, whilst James Shelvey was christened at Rugby, Warwickshire, on October 7th 1860. The first recorded spelling of the family name is shown to be that of Anna Shelvey, which was dated May 8th 1683, marriage to Jeremiah Kelly, at St. James', Duke's Place, London, during the reign of King Charles 11, known as "The Merry Monarch", 1660 - 1685. Surnames became necessary when governments introduced personal taxation. In England this was known as Poll Tax. Throughout the centuries, surnames in every country have continued to "develop" often leading to astonishing variants of the original spelling.